Here’s a sleek new Mercedes Benz model. Why would you expect otherwise? Great to drive and superbly well designed for making every drive a thrill, the Mercedes Benz A45 AMG is always going to bring a smile to your dial. 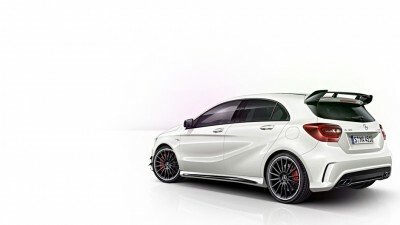 This is the quick new A-Class model that offers instantaneous acceleration at any speed. It may be the smallest Merc, but it’s big on style and is actually bigger than its predecessors. Let’s take a closer look. New materials for the A45 AMG interior keep the car fresh and aesthetically pleasing. Leather front sport seats that are fully electronic and heated set the tone for an impressive cabin. Rear seat room is good, though you’re not going to fit a massive amount in the boot unless you make use of the handy split-folding rear seat design. Touches of shiny silver detailing across the dash and throughout the interior insures the A45 AMG looks as elegant and sophisticated as its bigger siblings. It is a comfortable interior and the finish is good. I think some of the A-Class competitors have caught up on the overall plushness and quality workmanship that Mercedes have always been renowned for. Equipment levels for the best in on-board technology are good. In its standard guise, the Mercedes Benz A45 AMG is a very well equipped vehicle. You can opt for even more panache, particularly when you choose the Exclusive Package. The Exclusive Package boasts full leather upholstery with contrasting topstitching, and upper dashboard in black ARTICO man-made leather, the trim in a special interior colour, THERMOTRONIC dual-zone climate control with rear vents, a convenience infrared opening/closing passenger mirror, reverse parking position and floor mats with edging in your chosen interior colour. I’m a fan of the Mercedes Benz “elegance with simplicity” approach to their interior design work. You really do find yourself attracted to the nice dash contours and balance. Round air vents with a star divider attract the eye’s attention, and they really do look excellent. The front seat comfort is excellent, the ergonomics excellent and the well lit cabin provides great visibility around the car for all occupants. At night, the single-tone lighting from the headrests, door trims and multi-function holder create a classy and beautiful cabin ambience. If you like to lift your eyes to stare at the stars at night and the blue sky by day, then the panoramic sliding sunroof is an option that you’re going to want to have. 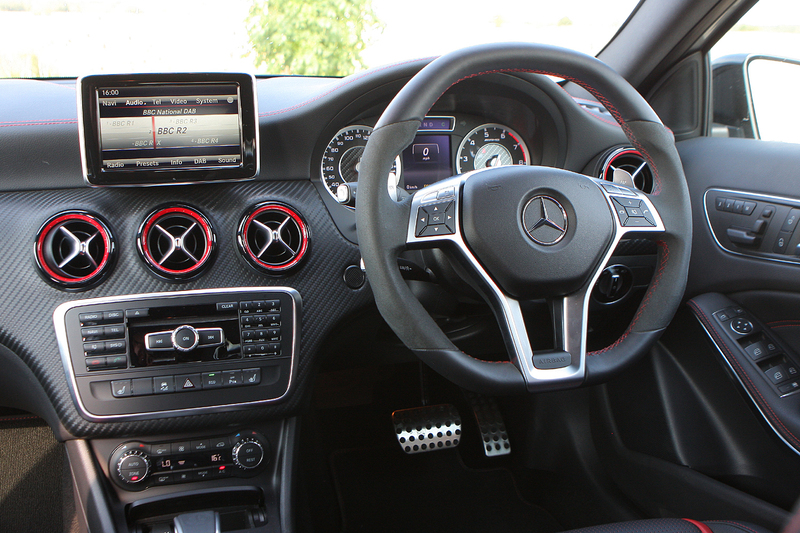 Other cool features that the A45 AMG offers is the three-spoke multifunction steering wheel with twelve buttons. The left-hand cluster is used to operate the menus, while the right-hand cluster controls the audio and telephone telematics functions. Sounds complicated at first, but you’ll get used to it in time. What will really get your heartrate up in the A45 AMG is the extra horses under the bonnet. This is the A-Class performance model and it can really move. The performance tuned 2.0-litre petrol engine has a peak power of 265 kW and a maximum torque of 450 Nm between 2250 and 5000 rpm. The end result is an astonishing 4.6 seconds to crack the 100 km/h from a standstill. On the open road, you do need to use the cruise control feature or the revenue collectors will have their twinkly lights surrounding you. Superb overtaking ability and road-holding is a feature of the small Mercedes Benz A45 AMG, and driver satisfaction is guaranteed. Running with 4MATIC all-wheel drive and an AMG SPEEDSHIFT DCT 7-speed sports transmission, this model always offers solid grip and control even in the wet. Fuel economy for the A-Class AMG model is really good, considering all the performance on offer. You should be able to average around 7 litres/100 km. Five-star safety is part and parcel of the A45 AMG, so if you’re on the lookout for arguably the best performance small-hatch on the market, then do get down and check this particular A-Class model out. For any more information on the Mercedes Benz A45 AMG, or for that matter any other new car, contact one of our friendly consultants on 1300 303 181. If you’d like some fleet discount pricing (yes even for private buyers! ), we can submit vehicle quote requests out to our national network of Mercedes dealers and come back with pricing within 24 hours. Private Fleet – car buying made easy!